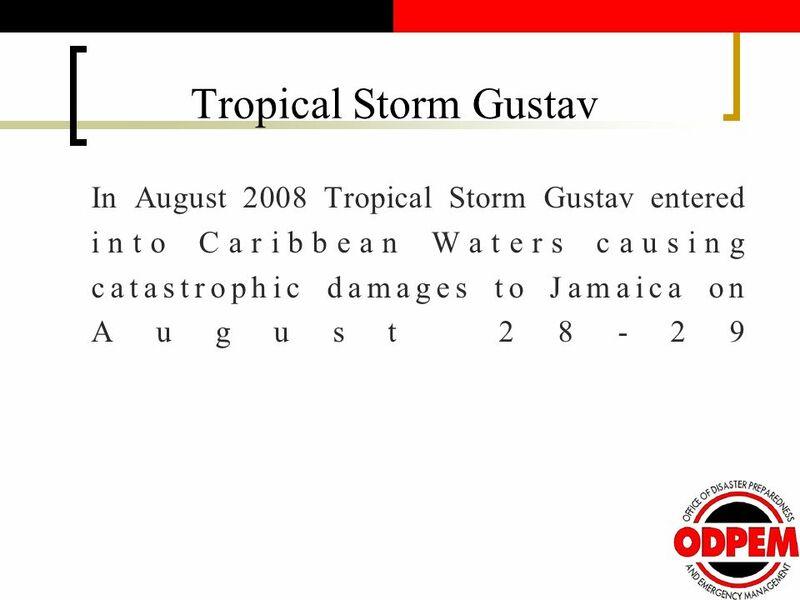 3 INTRODUCTION Caribbean States are highly vulnerable to natural disasters where, on average one major hurricane affects a country in the region every two years. 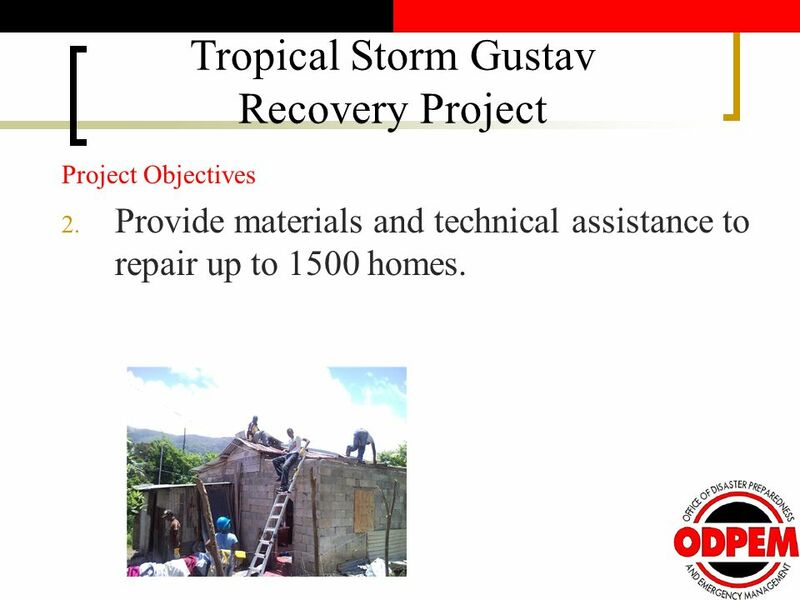 8 Tropical Storm Gustav Recovery Project The Jamaican Government met the needs of the 400 homeless but could not meet that of the 1500 severely affected. 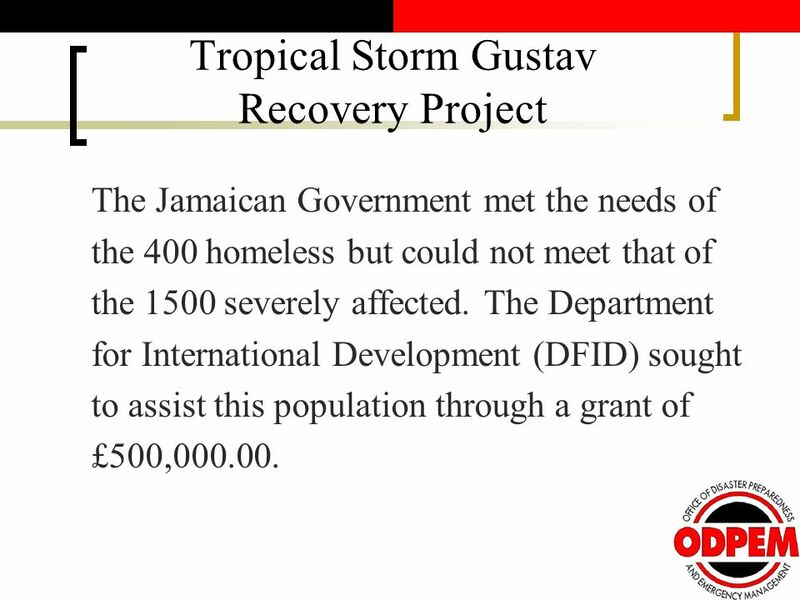 The Department for International Development (DFID) sought to assist this population through a grant of £500,000.00. 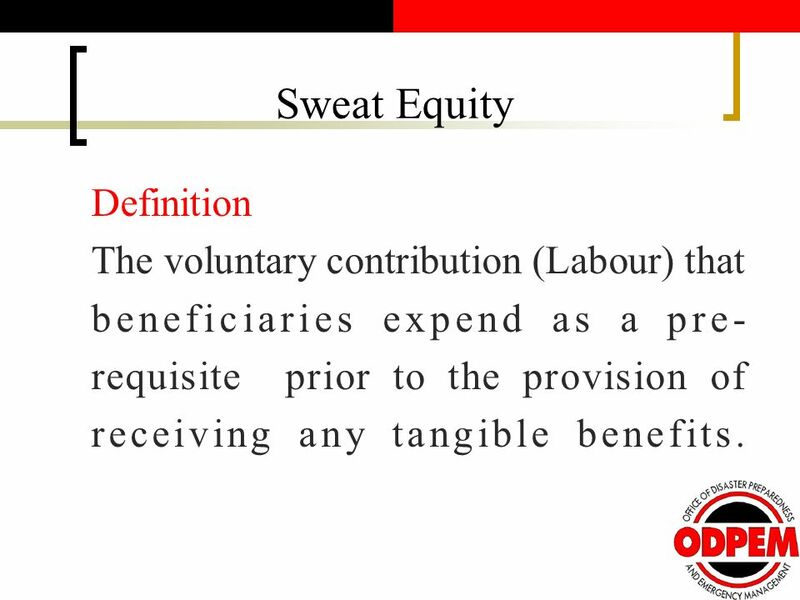 15 Sweat Equity Definition The voluntary contribution (Labour) that beneficiaries expend as a pre- requisite prior to the provision of receiving any tangible benefits. 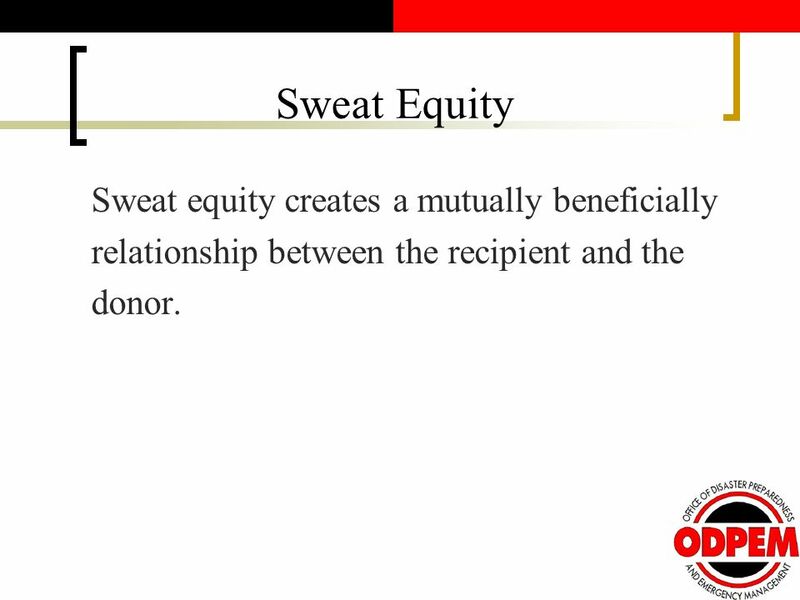 17 Sweat Equity Sweat equity creates a mutually beneficially relationship between the recipient and the donor. 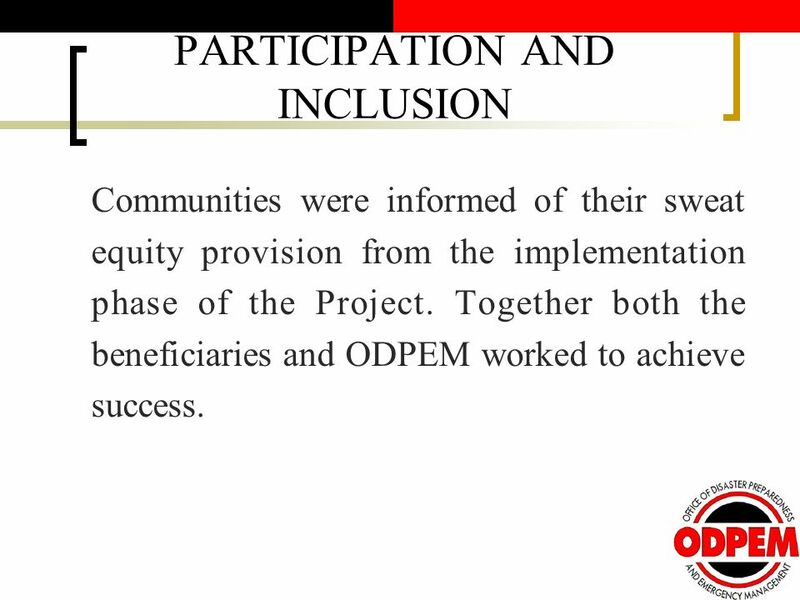 20 PARTICIPATION AND INCLUSION Communities were informed of their sweat equity provision from the implementation phase of the Project. 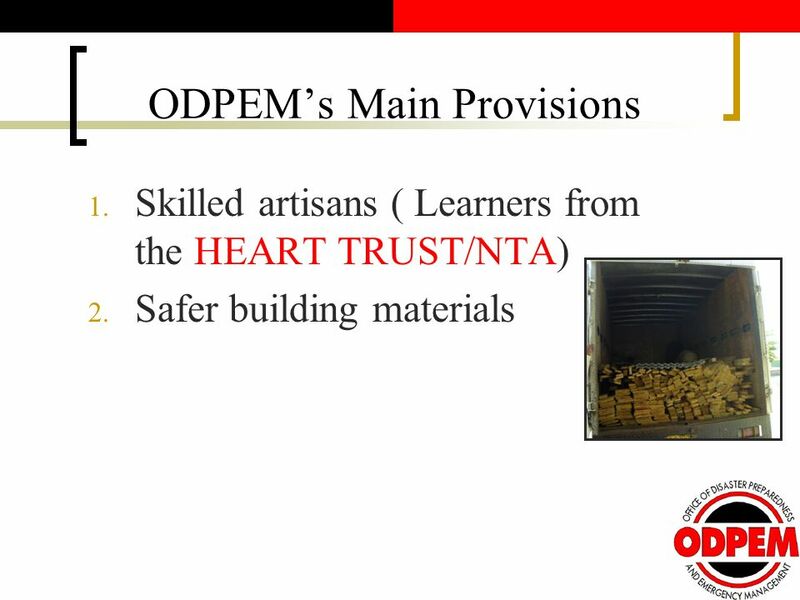 Together both the beneficiaries and ODPEM worked to achieve success. 23 Pre-Implementation Phase 1. 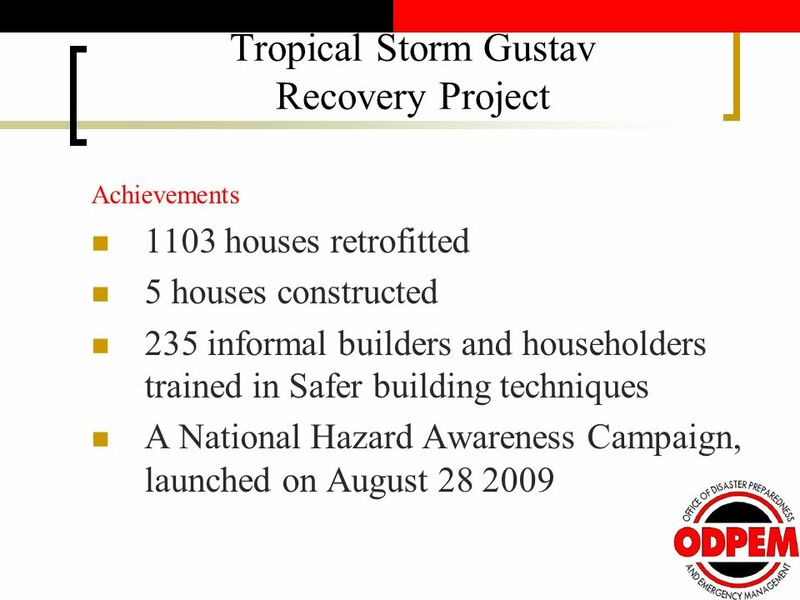 Residents were cynical about the Project. 2. 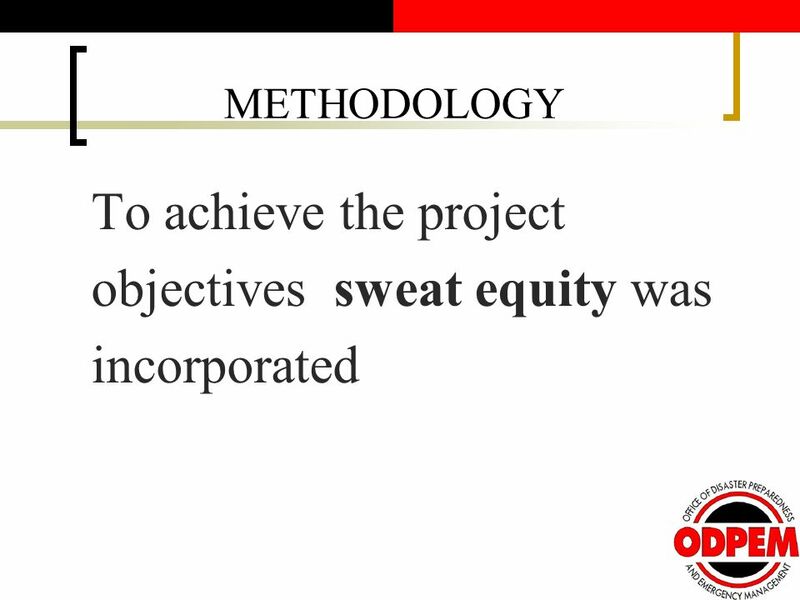 Residents were reluctant to carry out any form of sweat equity. 3. 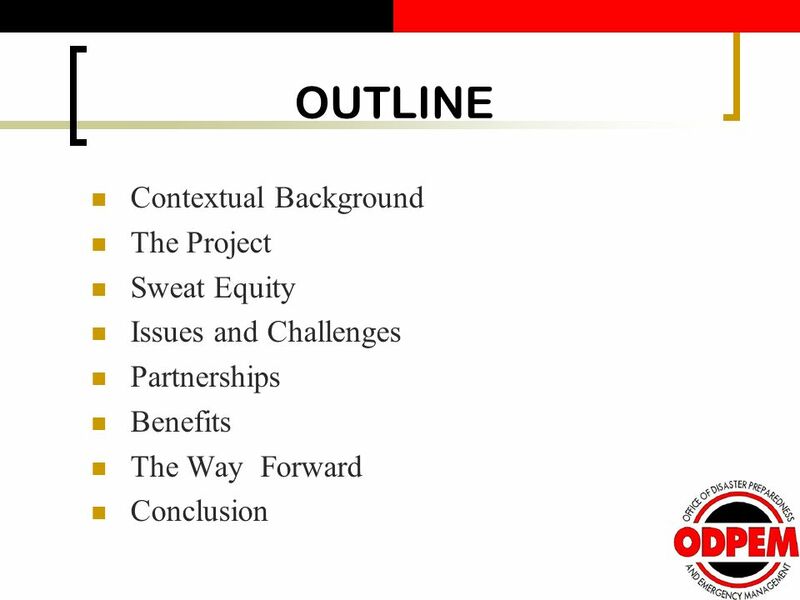 Some residents were unable to carry out sweat equity. 24 Pre-Implementation Phase 1. 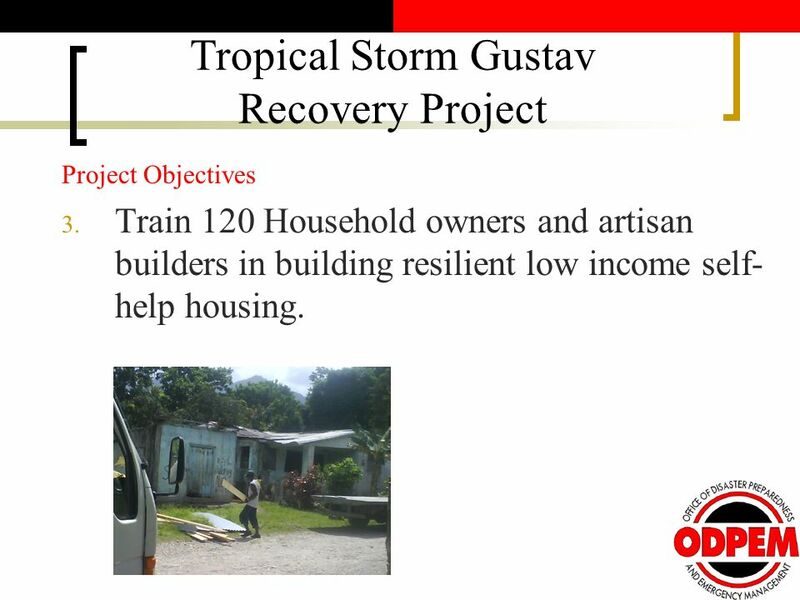 Residents were cynical about the Project. 2. 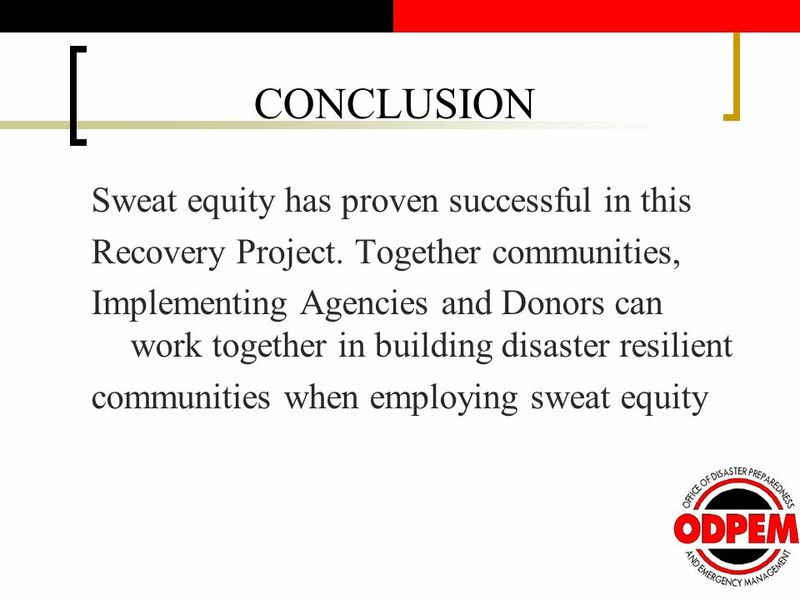 Residents were reluctant to carry out any form of sweat equity. 3. 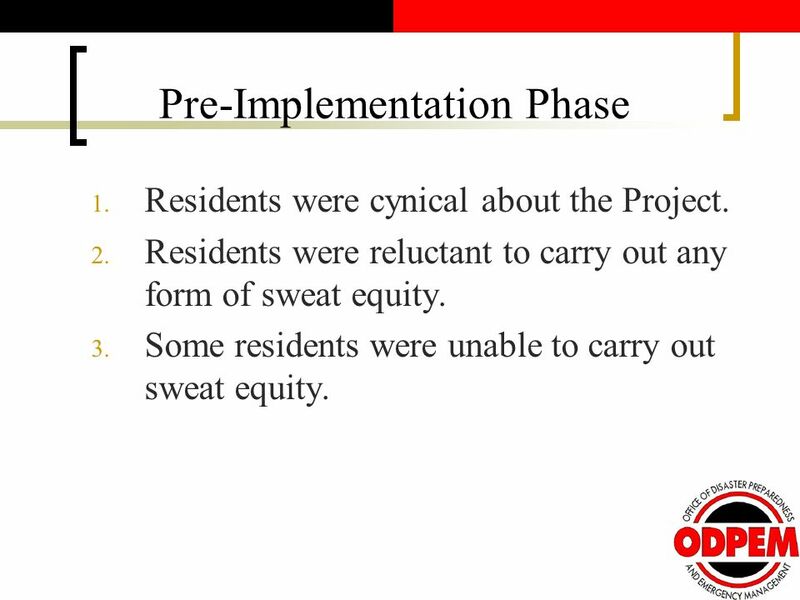 Some residents were unable to carry out sweat equity. 25 Implementation Phase 1. Initial refusal to cover double handling costs. 2. 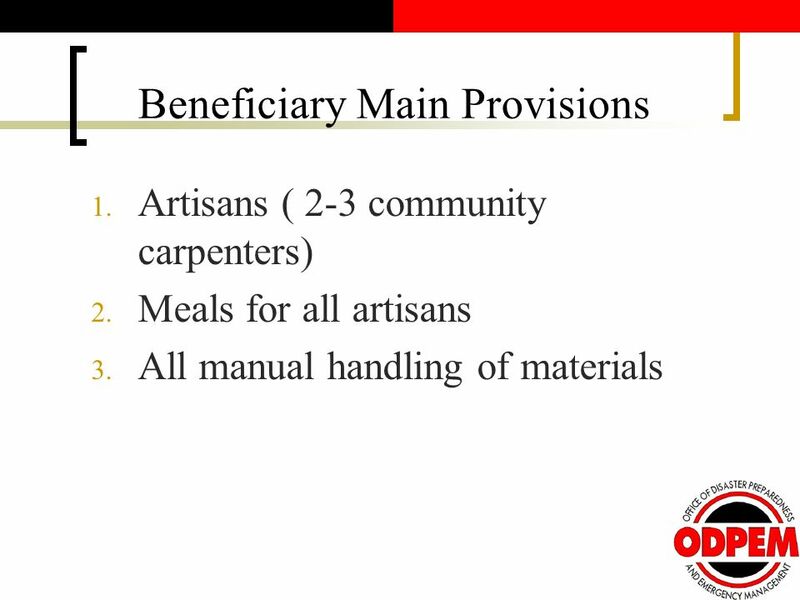 Low community artisan turn out in some communities. 3. 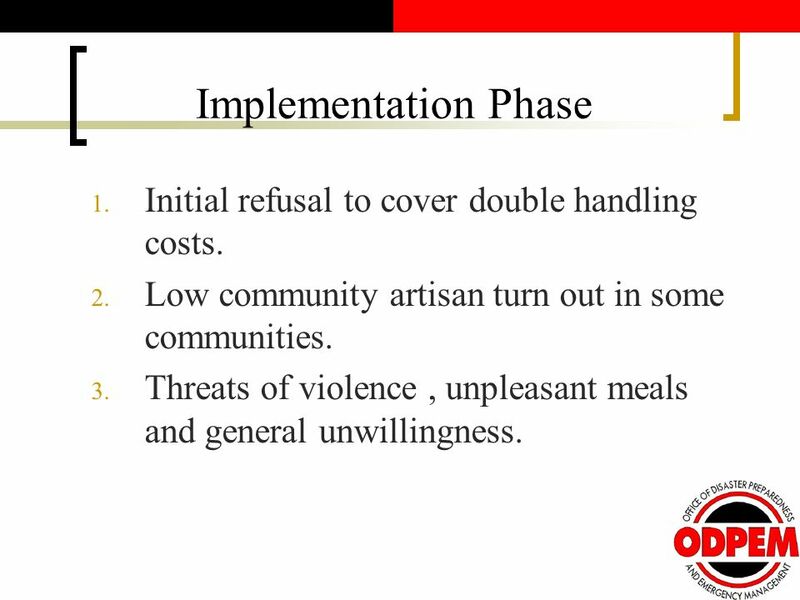 Threats of violence, unpleasant meals and general unwillingness. 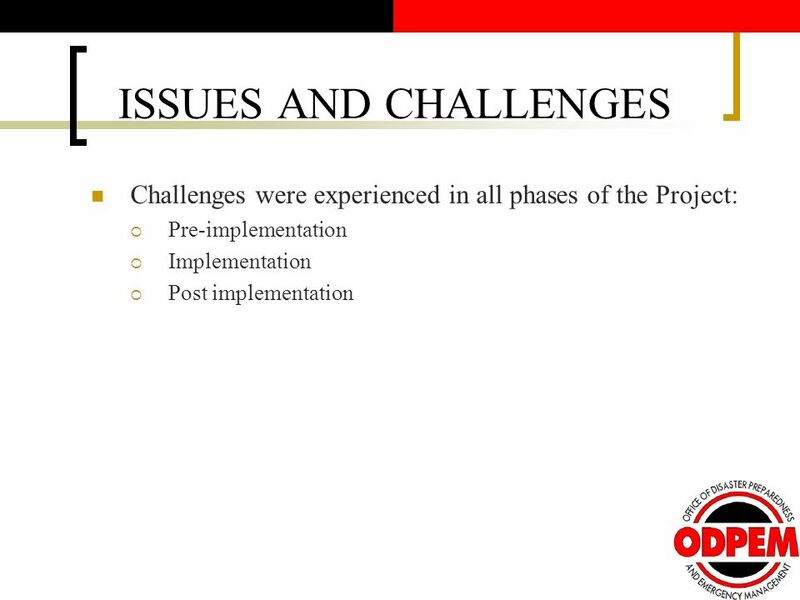 26 Post Implementation Phase 1. Financial expectation of some residents 2. 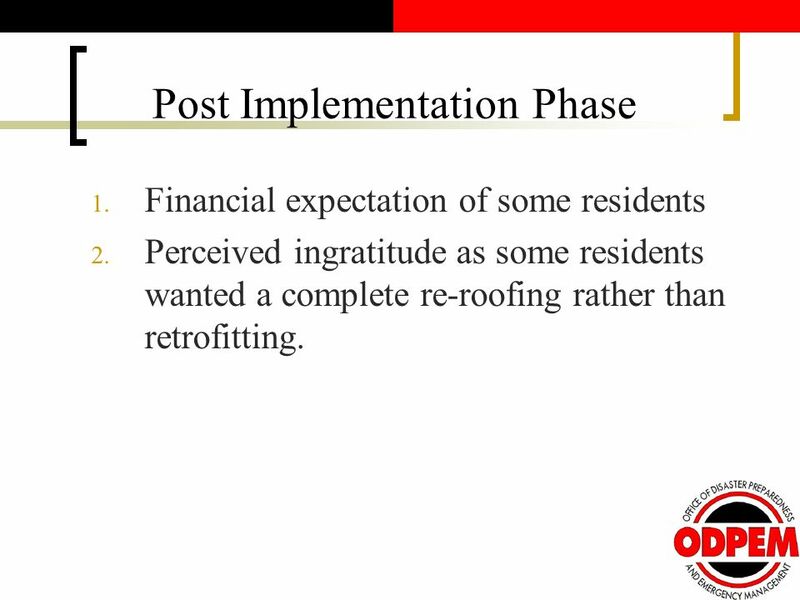 Perceived ingratitude as some residents wanted a complete re-roofing rather than retrofitting. 27 BENEFITS 5. 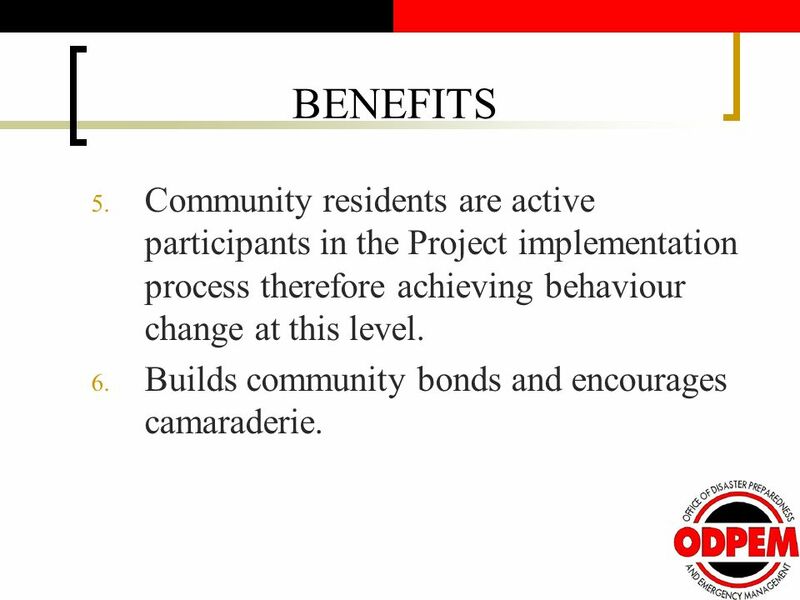 Community residents are active participants in the Project implementation process therefore achieving behaviour change at this level. 6. 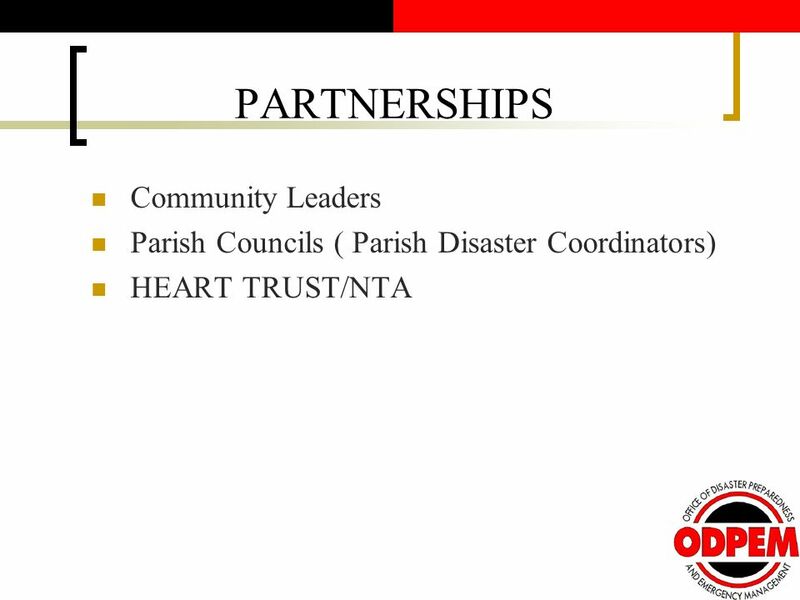 Builds community bonds and encourages camaraderie. 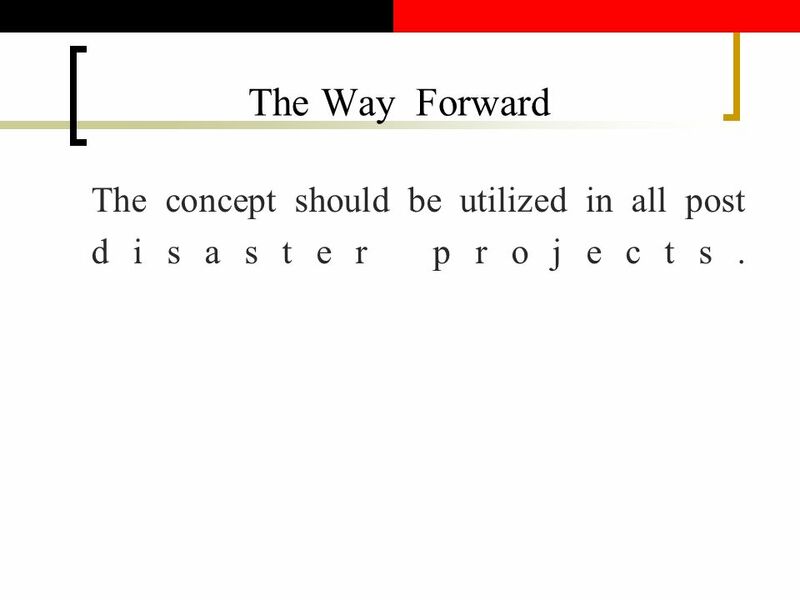 28 The Way Forward The concept should be utilized in all post disaster projects. 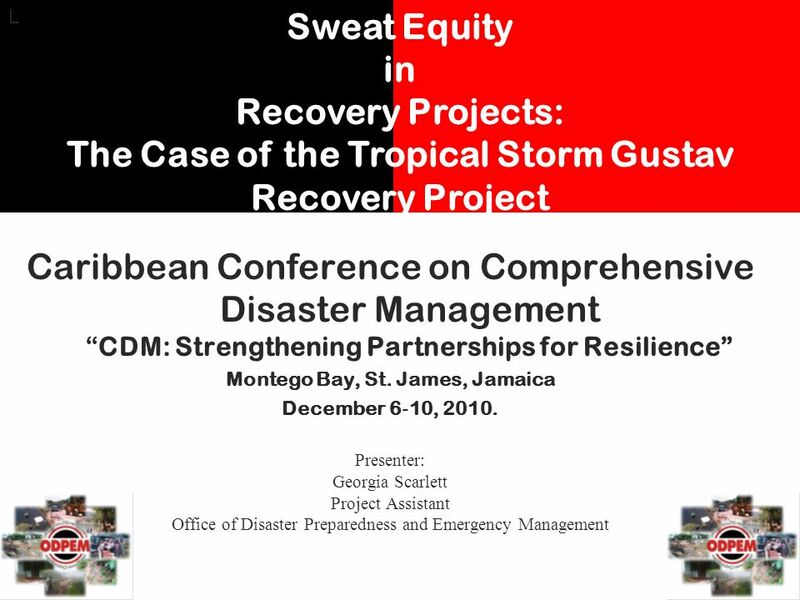 Download ppt "Caribbean Conference on Comprehensive Disaster ManagementCDM: Strengthening Partnerships for Resilience Montego Bay, St. James, Jamaica December 6 10,"
1 REGIONAL CONSULTATIVE MEETING OF NATIONAL PLATFORMS ON DRR & DIALOGUE ON CLIMATE CHANGE ADAPTATION, October 20-22, Panama NATIONAL PLATFORM. 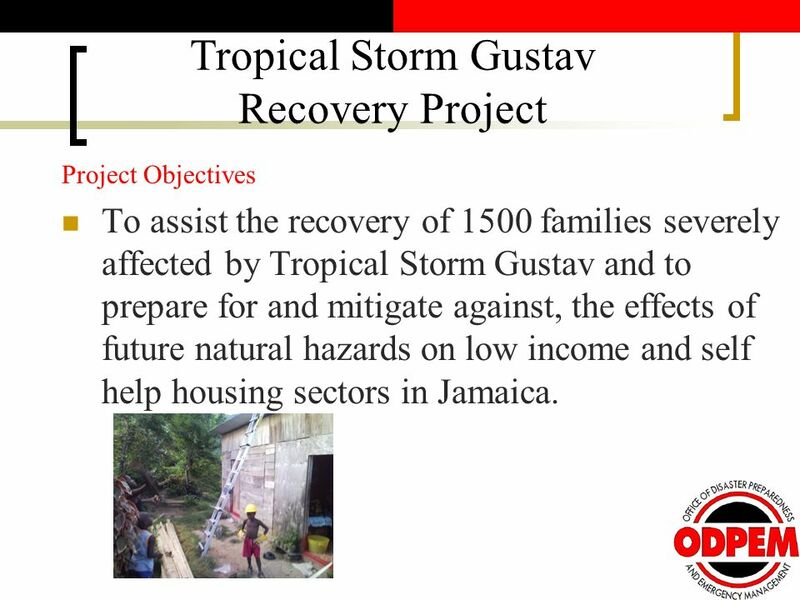 Strengthening Risk Management And Social Reconstruction to Reduce The Vulnerability Of Victims Of Natural Disasters The Experience of Saint Lucia. 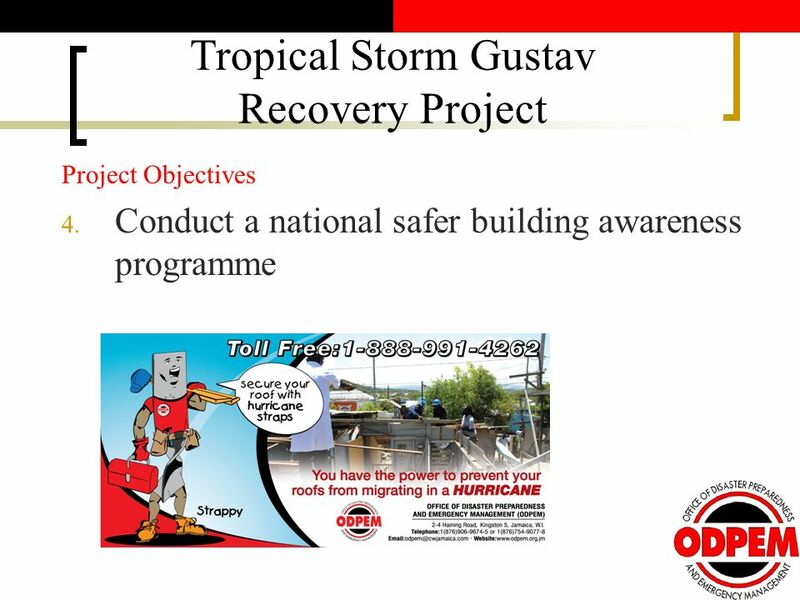 1 World Meteorological Organization TCP Activities in support of DPM Programme Koji Kuroiwa Tropical Cyclone Programme. Recovery led Drugs Policy – Employment and Welfare Reform Neil Hodgson 20 July 2010. Local Integration of Refugees in Belarus, Moldova and Ukraine March 2009 – February 2011 EU-funded project Implemented by UNHCR. 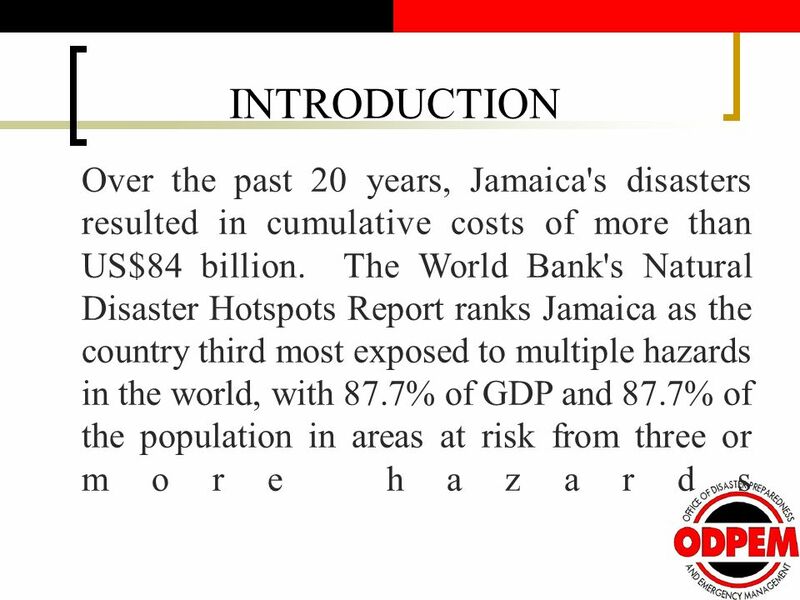 International Course on Development and Disasters with Special Focus on Health February 10 – 21, 2003: St Anns, Jamaica CDERA Experience in Institutional. Investing in the Cascading Forecasting Process in Modernizing National Meteorological and Hydrological Services WB & WMO. 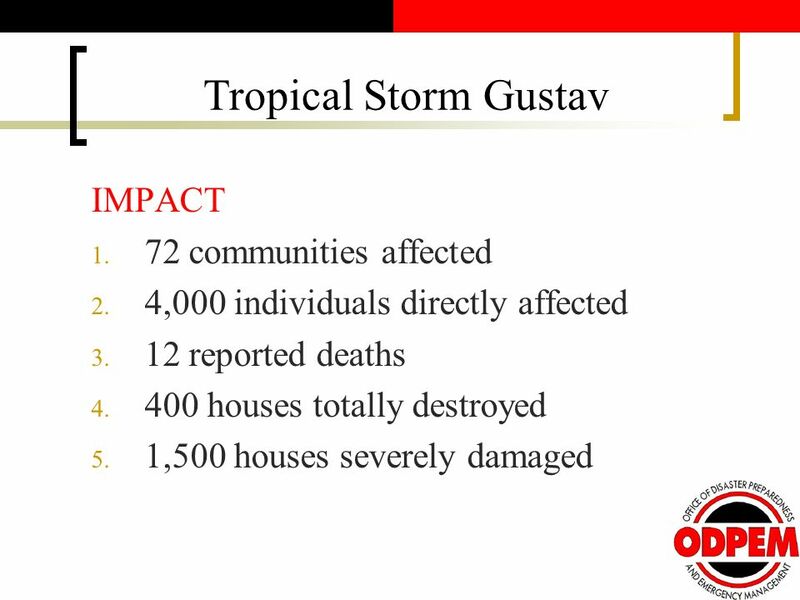 DISASTER MANAGEMENT AND ECONOMIC IMPACTS OF DISASTERS By NEVİN PEYNİRCİOĞLU Republic of Turkey State Planning Organization October 2004. Comparative Emergency Management Damon Coppola June 10, 2010. 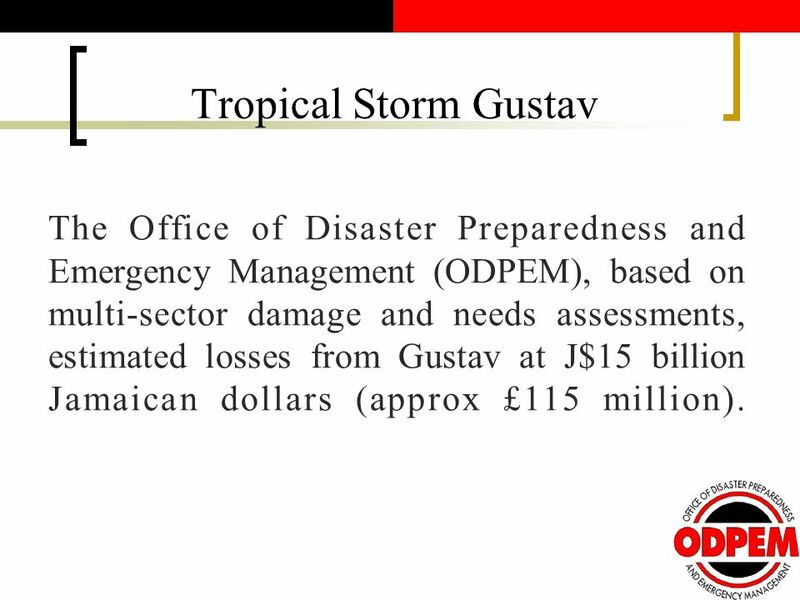 IDB Draft Disaster Risk Management Policy 0 Bruce Juba Representative Country Office Barbados Inter-American Development Bank Comprehensive Disaster Management.